In this studio course students will establish a critical position through individual or collaborative creative exploration and articulation. 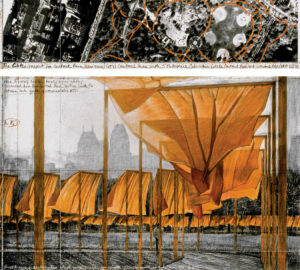 With opportunities for varied contextual applications, students will consolidate and expand spatial design concepts, techniques, skills and processes in the production of their creative work. This is a 30 credit course, with an expected workload of 20 hours per week, including 6 hours of class/studio time on Tuesdays and Fridays 9-12. Propose a temporary spatial intervention that engages with the notions of time, territory and flow. This intervention should exist in relation to the SCAPE 2017 pathway outlined on the map. The terms time, territory and flow reference ideas of event, ownership, movement and history each with differing relationships to a central concern of the body and the site or the body as site. As a spatial practitioner, you will define or identify the relationship that your intervention has to the SCAPE pathway. This could mean your response operates as a roving intervention with multiple meanings across the entirety of the pathway, a digital component, a transportable artefact, event or performance, individually driven, a set of instructions, an object, a tool, a performative gesture. This brief asks you to explore ideas around transitional space. What are the physical, conceptual, theoretical and literal understandings of the term transitional? To consider the concepts of Va and Wa in your investigation of time, territory and flow and the relationships between place, body, material and event. Making. Testing. Prepare for Friday. Test outside. Health and Safety: complete risk assessments. Run sheets for the day. Group discussion on ideas to date. -Selection of drawings (those with * are minimum/must haves): site map*, plan*, section* perspective*, models (documentation of), video, sketches. 1:1 prototyping – situate outdoors where relevant/possible. 2-3min presentation of project: key ideas, scale, engagement, link to SCAPE, materials. 2-3mins feedback. 8.15-9.00: Set up space, load presentations. 9.05-11.30: 5 min (total) digital presentations (slide template on Stream), maximum 5 slides. 11.40-11.50: Break and into groups. 11.50-12.45: Post-it notes feedback session.